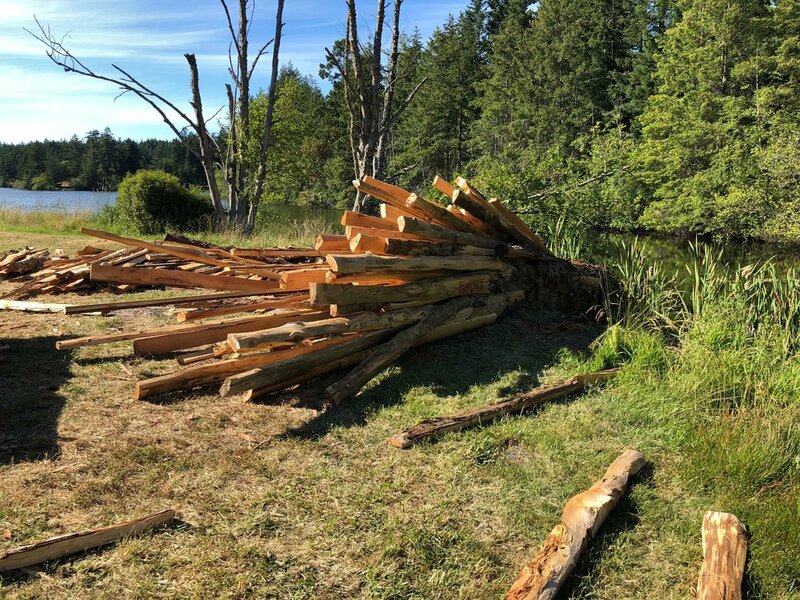 A red cedar log felled on its side at the edge of a lake explodes into large splintering shards of wood. From this chaos the pieces align themselves to form a split rail fence. The wooden log is used temporarily for man’s purpose as a boundary to divide land and water but in time it will decompose and return to nature. The red cedar tree trunk arrives to the site. 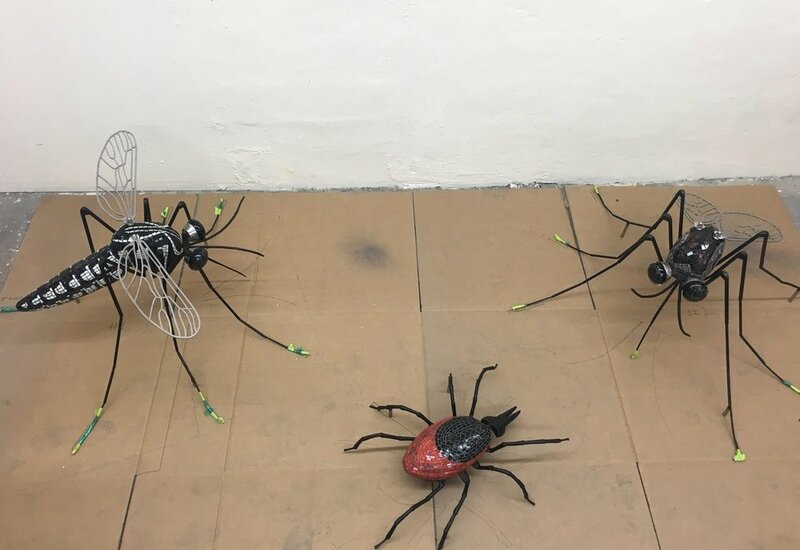 A glimpse into the process of creating an Aedes Aegypti mosquito, a Culex mosquito and a Black Legged tick. All three pieces were commissioned for the Thermacell Headquarters. 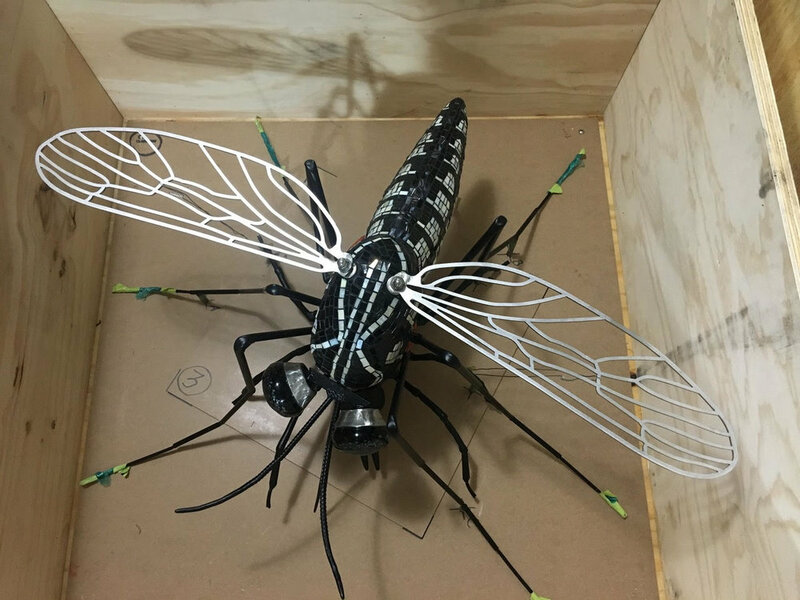 Aedes Aegypti and the Black Legged tick are ready to go in the shipping crate to Thermacell Corporate Headquarters in Bedford MA to be placed on the walls of the reception area. My latest project, Pair of Peregrines, I started at Anderson Ranch during the January 2018 Intensive Sculpture Residence. 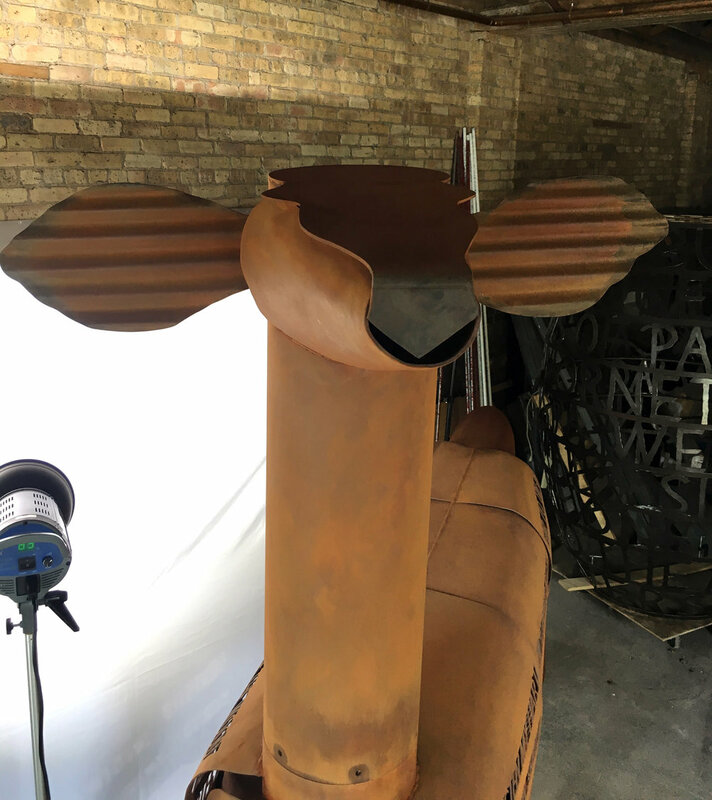 Dear Deer began at Anderson Ranch with the plasma cut poem in the armor, The piece was finished at Penland in two parts, so it could be easily transported from Asheville, NC back to Chicago. The final step is adding a rust patina at the studio in Evanston. The piece "No Fear" has had a title change to "Attached" AND.... It's finished waiting to be installed when the ground thaws this spring. This is the rendered proposed piece. However, the wasp will face down and there will be a 5' hexagonal base to deter climbing. Base ring- with text "OF THE UNIVERSE" and Barbarini wasp ding bat. New jig reaches 8' to place all the rings, This will be removed once they are in place. I had to learn to drive a bobcat! Safely installed in front of the South Shore Cultural Center. Glass blowing for Contemporary Tapestry. Making of "The Night Butterfly"
Using the maquette as a guide the oak leaf structure for the moth was made in Pilsen with sculptors, Wes Kim and Nathan Aldredge. The smaller veins were first bent in a vice, but the tree trunk worked best. The next set of photos show the process for making the moth. Clair Beeson was my helper. Making "Dung Beetle Navigates by the Stars"
Welded steel armature was powder-coated then foam packed around it. The foam was carved, covered with fiber glass tape, and two layers of concrete. The concrete shell was covered with a glass mosaic which was grouted. The globe was made from a steel armature covered with a 24" hollow foam sphere, then covered with fiberglass tape and two layers of concrete. Then it was covered with dark blue stained thin set and pieces of colored, crushed glass. 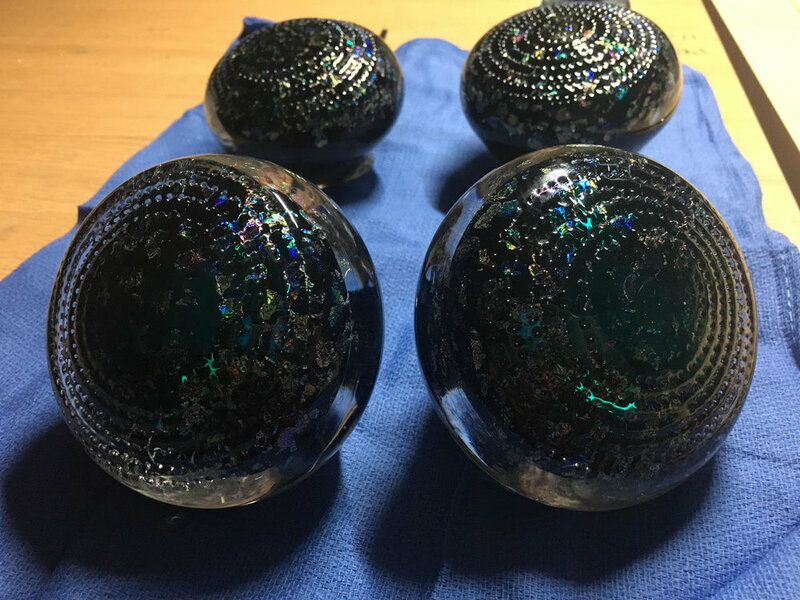 Several sizes of glass rod were inserted to replicate the constellations. An LED battery powered light was inserted into the globe so the glass rods light up like stars in the night sky. Making "No Fear" and "Love Bugs"
These photos show the process for making the wasp portion of the sculpture "No Fear" and the two "Love Bugs"
Kinderhaven is a place that aims to stimulate the growth of all the facets of the personalities of the preschoolers. When Kinderhaven needed some decorative artwork for the barren exterior of it’s building they chose Lake Forest artist Janet Austin to design and execute the project. An excellent choice, as Austin has a resume of public arts works made in collaboration with children. She made a design of a tree and root system and had the children, ages 3 - 7, make clay pieces or stars, leaves, butterflies and worms to fit into a mosaic which would be installed on the outside of the building. All the children can then see the work they’ve done, they can be proud of the fact that they helped build the art piece.